Since 1939 Pilatus Aircraft Ltd. has been manufacturing innovative and diverse aircraft for the world transportation market. With a blend of utility, form, and function, Pilatus has developed unique aircraft that run the spectrum of aviation roles from executive transport to military trainer to cargo and relief aircraft. The rugged and beloved PC-6 “Porter” is one of the most fantastic aircraft ever engineered while the svelte PC-9 is the basis of the United States T-6A “Texan II” JPATS training aircraft. Rounding out the modern line of Pilatus aircraft is the beautiful PC-12 which is one of the most adaptable aircraft on the market today. Flight1 (http://www.flight1.com) chose to model the PC-12 as an add-on aircraft for Flight Simulator 2004 and ended up with a great product that even earned the endorsement of Pilatus Aircraft. 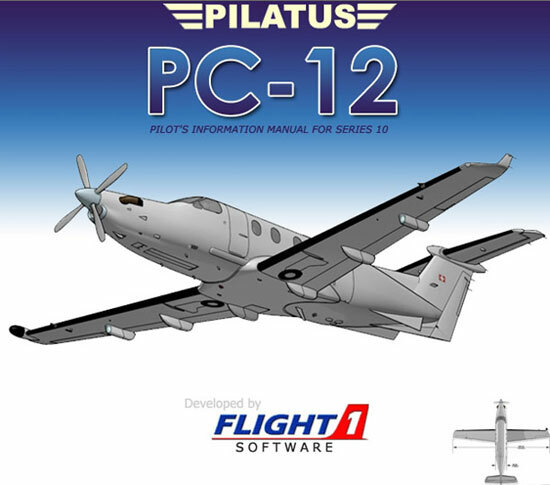 The PC-12 is available from the Flight1 website as a 108MB direct download ($26.95) or alternatively as a boxed product ($29.95). My review copy was the boxed product, which had a nice DVD case, the CD, and some Flight1 product fliers. Most people would probably prefer the easy and painless direct download method which will give you instant gratification for your purchase! Documentation, as has become the norm for almost all software (Dangerous Waters – you are my heroes! ), is in the form of files on the CD which install to your hard drive. 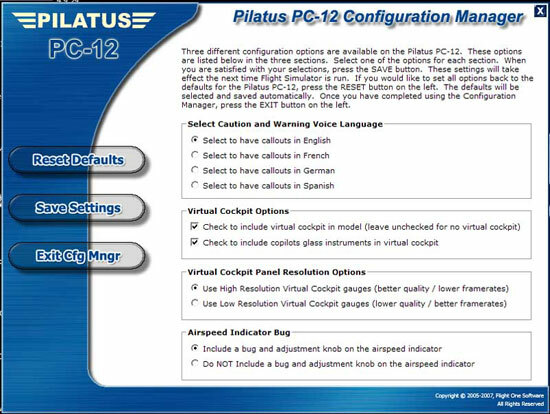 The installation also places a small configuration program on your desktop with which you can configure options for the PC-12 such as language preferences, inclusion of the virtual cockpit, and flight instrumentation performance. Installation of the product was swift and painless which is no surprise since Flight1 has an outstanding software distribution and installation process. 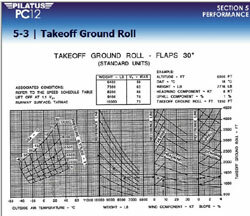 Documentation consists of a “Pilot’s Information Manual” and a tutorial on how to fly the PC-12. The manual is in an HTML format, which puts a contents pane on the left side of the screen and the information in each section on the right side of the screen. Initially I wasn’t very happy with this format because I’m more accustomed to using PDF files, but I must admit that the ability to quickly scan down the content pane and select the appropriate segment of the manual is more similar to using a tabbed checklist in a real aircraft. For the purists you can still print the manual and I printed a couple test pages and they came out fine with nice text, graphics and color. If printed, I would approximate the manual would come out to approximately 80 or so printed pages, which I feel is a good length for an add-on manual. The manual is thorough, but not so ambitious as to describe useless information such as how the conditioned bleed air routes through the firewall into the cabin manifolds. It is not a replication of the exact PC-12 Pilot Operating Handbook, which in my opinion is a good thing. Graphics and text within the manual are sharp and informational and the information in the manual is nicely indexed and formatted in a logical arrangement. 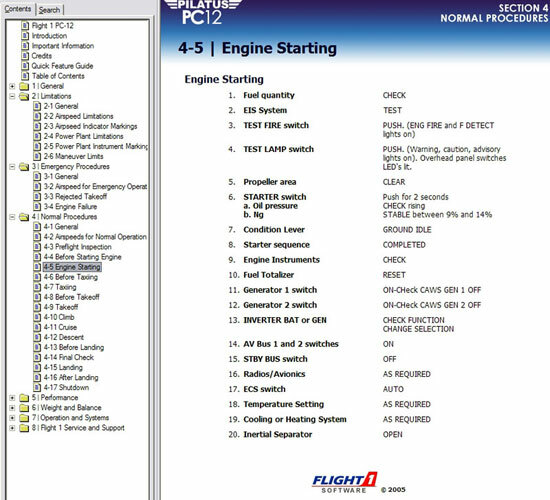 The manual includes normal and emergency item checklists although there are some items on the checklists that appear to be taken from the actual aircraft checklists that aren’t actually modeled in the Flight1 PC-12. 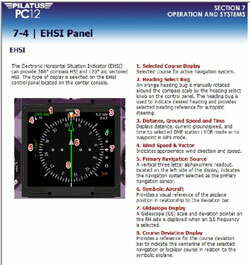 For instance at one point on the “Engine Starting” checklist you get to item #17 which is “ECS switch – AUTO”. ECS stands for “Environmental Control System” and the switch is not on the 2D panels and though you can find it in the virtual cockpit (VC) it does not function. It would have been nice to have put (not modeled) next to those items which can’t be accomplished via the checklists. Overall though, the manual is very nicely done. 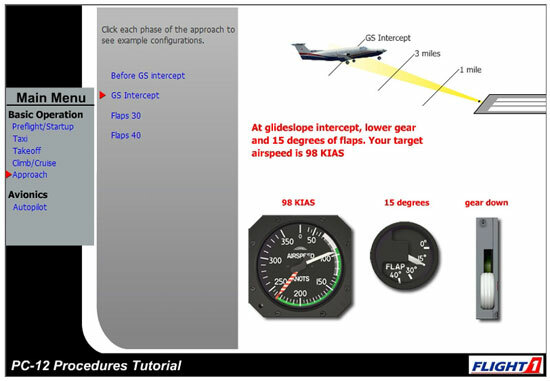 The tutorial is in Flash format and is very useful for getting to know the cockpit of the PC-12 and learning the proper techniques for the different modes of operation (start, taxi, takeoff, etc.). The animations and voice-over instructions are very well done and I would highly recommend spending a few minutes going through the tutorials since they point you in the right direction on how to properly fly the aircraft and work the systems such as the auto-pilot among other items. For our demonstration flight today we’ll be flying our PC-12 from Seattle-Tacoma airport (KSEA) up north to the city of Ketchikan (PAKT) which is located on the very southern tip of Alaska. Ketchikan lies along the “Inside Passage” and is breathtaking in its scenery and beauty. 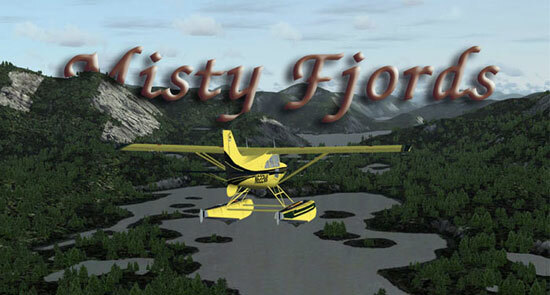 To supplement our experience we will be flying into Holger Sandmann’s stunning add-on scenery package called “Misty Fjords”. The scenery is spectacular and it will be easier to show you rather than describe it.